Our Basement Sump and Pump experts have pulled together a top 10 list of the most frequently asked questions that we have received regarding problems with macerators. Exactly what does a macerator do? 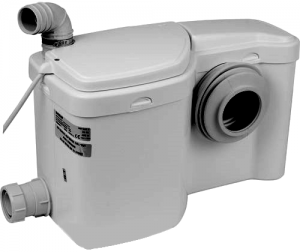 Macerators are designed to pump away waste materials from toilets, as well as other waste waters without depending on a regular drainage system. What is the best way to install a macerator? Every macerator is unique; therefore it is essential to comply with the instructions within the manual which comes with it. However, as a basic guideline, the majority of macerators slide behind the toilet. You should then be able to pull the rubber over the opening of the toilet from the macerator. Once this is done, you must plumb in the opening from the macerator to the soil pipe or stack. When this step is completed, it is essential to have an electrician present, as you could possibly be violating industry regulations and the law. What would happen if I put incorrect substances in the macerator? In the event you insert the wrong substances down the toilet, there would most likely be a jam or block use of the rota along with the outlet waste that is being pumped out, resulting in an emergency call out. I live in a rented property, What if the macerator gets blocked, is the landlord accountable for this? In the event the macerator is blocked it is the duty of the landlord to ensure it is safe. Provided that there is certainly a primary toilet within the house, the landlord is within his legal rights to arrange a plumber to visit on a standard weekday. Nevertheless if perhaps the problem of the macerator is a result of misuse, then this will be the accountability of the tenant. It is wise to determine if there is power getting to the macerator, as it establishes if the macerator needs replacing or not. Macerators can seem to be loud however, only potentially as loud as a washing machine or even a dishwasher. What is the average cost for a macerators and the installation? Macerator costs range between, £150 to £600 based on the manufacture, the guarantee, the brand and what the macerators will likely be useful for. A reliable macerator would most likely cost roughly between, £280 to £600. To get a macerator installed this would cost on average £500. What is the average life span for the macerator? The common rule regarding macerators, is the machine, which will usually last up to 15 years, if handling a small amount of waste. With standard usage in a main bathroom in a domestic home, you can assume a macerator to last at least for about 10 years. If the macerator has been utilised in a high traffic for example on a commercial property, you would then calculate approximately 3 years. However there are actually specific macerators which are made specifically for commercial usage, though the cost for one will be considerably higher than a domestic macerator. Can a macerator also take other appliance? Dependent on the type of macerator, a macerator will take all types of soil waste, provided that it is within the guidelines and there are certainly no solids going down, such as kitchen waste or even wet wipes. See our list of things not to be put down a macerator. Should a qualified person be needed to install a macerator? Provided that the instructions are followed appropriately in full together with meeting all regulations then a qualified person, such as a plumber is not necessarily needed. However if in any doubt consult a qualified expert for further advice. How do I go about fixing a broken macerator? On many occasions, broken macerators can only be replaced, while any substitution on a macerator voids the guarantee, it is highly recommended to never try to exchange the components simply because of the kind of work required. Hopefully, you are fortunate enough to have a macerator that is only obstructed with undesirable item or the switch has accidentally been turned off or perhaps the fuse has gone. In the event the fuse has gone, it will always be beneficial to examine the cause, as the motor may need replacing or a common fault with the device.